The Global Volcanism Program has no activity reports for Cerro del Azufre. The Global Volcanism Program has no Weekly Reports available for Cerro del Azufre. The Global Volcanism Program has no Bulletin Reports available for Cerro del Azufre. Cerro del Azufre is the largest and youngest volcanic center of a 50-km-long, NW-SE-trending chain of Chilean volcanoes just W of the Bolivian border, S of Salar de Ascotán. The northern summit forms the high point of the andesitic volcano; an older southern stratovolcano extends SE towards the Pleistocene Cerro Aguilucho volcano. A large group of late-Pleistocene lava flows originating from the northern cone extends toward the northern flanks and partially overlies a debris-avalanche deposit now largely buried by the Salar de Ascotán. The Chanka (Pabellón) dacitic lava-dome complex occupying the lower W flank is pristine-looking, but has been Potassium-Argon dated at 1.5 million years. Two possible Holocene dacitic lava domes that were erupted along a NW-SE line E of the summit ridge mark the most recent effusive activity, but two youthful-looking craters on the main edifice could be Holocene. Roobol M J, Francis P W, Ridley W I, Rhodes M, Walker G P, 1976. Physio-chemical characteristics of the Andean volcanic chain between latitudes 21° and 22° south. In: Gonzalez-Ferran O (ed) Proc Symp Andean & Antarctic Volcanology Problems (Santiago, Chile, Sept 1974), Rome: IAVCEI, p 450-464. The Global Volcanism Program is not aware of any Holocene eruptions from Cerro del Azufre. If this volcano has had large eruptions (VEI >= 4) prior to 10,000 years ago, information might be found on the Cerro del Azufre page in the LaMEVE (Large Magnitude Explosive Volcanic Eruptions) database, a part of the Volcano Global Risk Identification and Analysis Project (VOGRIPA). There is no Deformation History data available for Cerro del Azufre. There is no Emissions History data available for Cerro del Azufre. The large volcanic complex at the center of this NASA Space Shuttle image (with north to the upper right) is Cerro del Azufre. 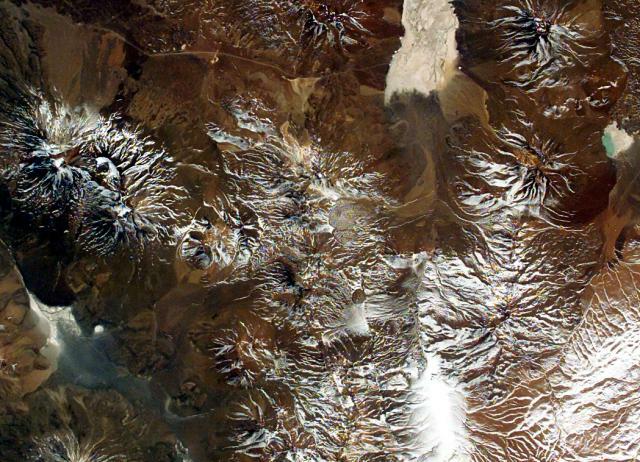 The 5846-m-high volcano lies just west of the Bolivian border, south of Salar de Ascotán (the light-colored area at the upper right). A youthful lava dome forms a small circular area below and to the right of the center of the image, and the Holocene San Pedro-San Pablo volcanic complex lies at the left-center. NASA Space Station image ISS005-E-8788, 2002 (http://eol.jsc.nasa.gov/). There are no samples for Cerro del Azufre in the Smithsonian's NMNH Department of Mineral Sciences Rock and Ore collection. Large Eruptions of Cerro del Azufre Information about large Quaternary eruptions (VEI >= 4) is cataloged in the Large Magnitude Explosive Volcanic Eruptions (LaMEVE) database of the Volcano Global Risk Identification and Analysis Project (VOGRIPA).